I finally wrote a book! For years friends would say, "Barney, you have such an amazing story, someone should write a book!" So I did. I wrote every word! After all, it's my story: I lived it. Here's your opportunity to purchase my book and learn the inside story of the Tight Lies golf club. Thanks for looking! I hope you'll enjoy the read! 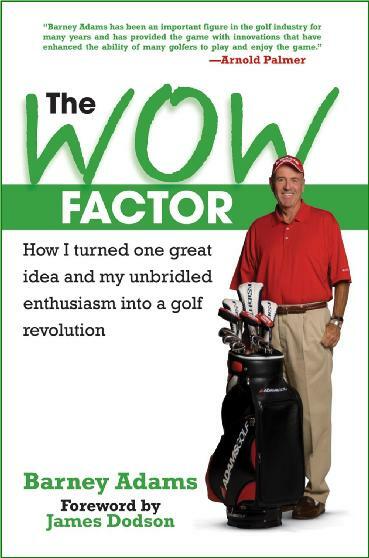 I highly recommend this book to golfers & anyone involved with business leadership. Barney Adams was Ely Callaway's choice to succeed him at Callaway Golf. Read this book to know why. Barney single-handedly changed how clubs are invented, introduced, marketed, distributed, and sold. His tremendous success is a testament to what can be done with out-of-the-box thinking and persistence. Every time Mr. Adams nearly succumbed to the competitive forces of the golf industry, he'd remember those WOW (moments) and keep going. The most important golf book of 2008. Barney Adams was the classic "overnight success" in the golf business.